Designer Corridor Sign Can Identify A Room Or Display Significant Message. The Double-Sided Design Mounts Perpendicular To The Wall For Easy Viewing. This Sign Has Been Engineered As A Quality Interior Sign System And Features A Distinctive Professional Look That Is Perfect For Offices, Courthouses, Schools And Warehouses. Choose From More Than 35 Fonts And More Than 30 Sign Colors. Contact Customer Service To Customize Your Plastic, 2" X 10" Sign With A Brown Frame.. Designer Corridor Sign Can Identify A Room Or Display Significant Message. The Double-Sided Design Mounts Perpendicular To The Wall For Easy Viewing. This Sign Has Been Engineered As A Quality Interior Sign System And Features A Distinctive Professional Look That Is Perfect For Offices, Courthouses, Schools And Warehouses. Choose From More Than 35 Fonts And More Than 30 Sign Colors. 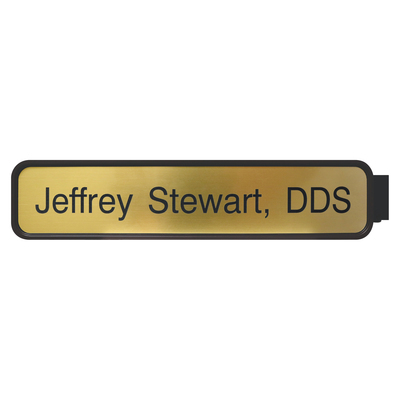 Contact Customer Service To Customize Your Plastic, 2" X 10" Sign With A Brown Frame.